A medium sized, deciduous tree with a rounded to broad-spreading, often irregular crown. Typically grows at a moderate-to-fast rate to a height of 50-75′ (often larger in the wild). Dark, lustrous green leaves (grayish-white beneath) with 7-11, toothed lobes which are sharply pointed at the tips. Leaves turn brownish-red in autumn. Insignificant flowers in separate male and female catkins appear in spring. Fruits are acorns (with flat, saucer-shaped cups) which mature in early fall. An abundant crop of acorns may not occur before this tree reaches 40 years old. A Missouri native tree which typically occurs on northern- and eastern-facing wooded slopes throughout the State. 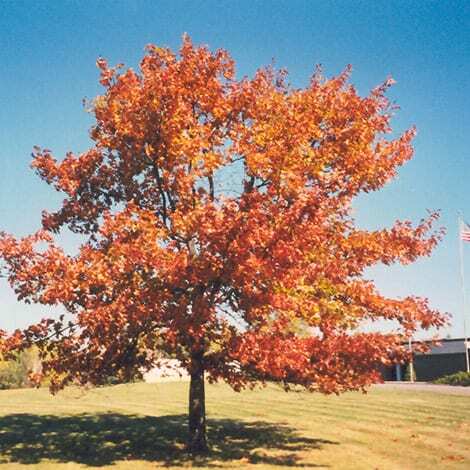 Also commonly called northern red oak.